Forbidden Magazine Omnibus. Here is the Hardcover limited edition version! In its five year existence, Forbidden Magazine interrogated and passed judgement on the most extreme artists in the world. Collected here are those conversations. 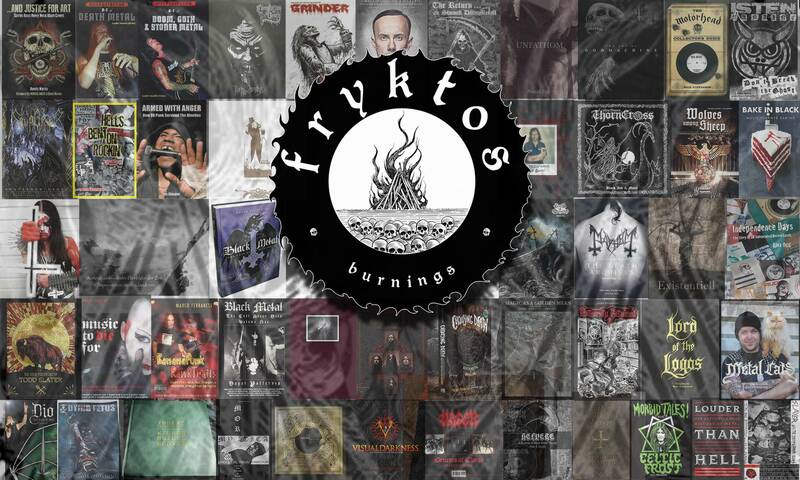 FUNEREUS, GOATCRAFT, BLACK ANGEL, HIRAX, ENTHRONED, DARKENHOLD, DARKEST GROVE, DIVINE CODEX, MANTICORE, DRACONIS INFERNUM, LECHEROUS NOCTURNE, THE BEST OF THE APOCALYPSE, IMMOLITH, PAGANFIRE, NOMINON, VIRVEL AV MORKERHATET, BURZUM, NADER SADEK, MARDUK, KHORS, SATANIC WARMASTER, KRIEG, SARGEIST, KULT OF AZAZEL, THORNSPAWN, LASANCHE, CANNIBAL CORPSE, GRAVEWURM, ROTTING CHRIST, SPELLCRAFT, EPISODE 13, GRAVESPAWN, PEYST, NEGURA BUNGET, SKITLIV, ABSCESS, TRANSYLVANIAN FUNERAL, DENOUNCEMENT PYRE, EYEHATEGOD, AVSKY, BALMOG, GJENFERDSEL, DEIPHAGO, PROSANCTUS INFERIN, WITHERSHIN, KILL, WATAIN, ANGUISHED, DECEASED, IMPIETY, LORD OF DEPRESSION, MALIGNANT CHRIST, NOX ILLUNIS, PATRIA, VALOTON, WHIPSTRIKER, NETRA, MOONREICH, OAKMOON, MANETHEREN, ECTOVOID, PLUTONIAN SHORE, HYPNOS, ISRATHOUM.